I am grateful for the words of greeting that Archbishop José Antonio Eguren Anselmi of Piura addressed to me in the name of all those present. Meeting with you, getting to know you, listening to you and sharing our love for the Lord and for the mission he has given us is very important. I know you have made great efforts to be here. Thank you! 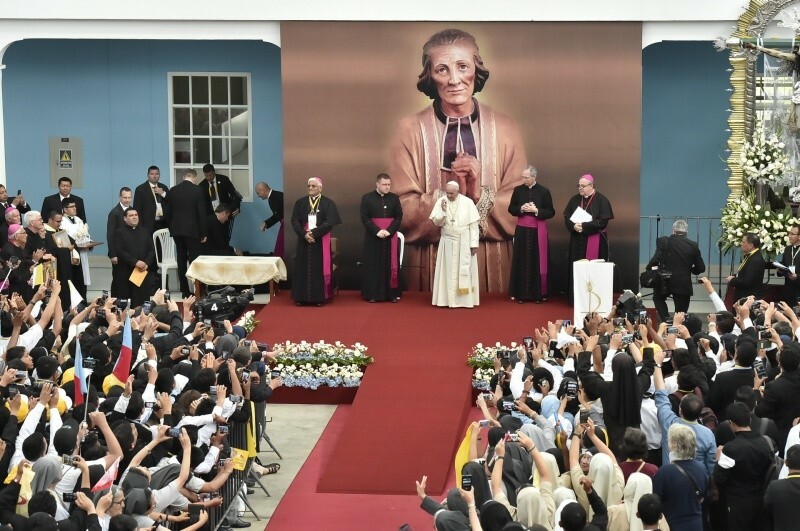 This Seminary College that welcomes us was one of the first to be founded in Latin America for the formation of future generations of evangelizers. Being together in this place makes us realize that we are in one of those “cradles” that have produced countless missionaries. Nor can I forget that Saint Turibius of Mogrovejo, the patron of the Latin American bishops, died in this land, in the midst of his missionary activity. All these things invite us to look to our roots, to what enables us through time and history to grow and to bear fruit. Our vocations will always have that double dimension: roots in the earth and hearts in heaven. When one of these two is missing, something begins to go wrong and our life gradually withers (cf. Lk 13:6-9). I like to point out that our faith, our vocation, is one of remembrance, that “deuteronomic” dimension of life. One of remembrance, because it recognizes that neither life, nor faith, nor the Church began with the birth of any one of us. Remembrance looks to the past in order to discover the sap that nourished the hearts of disciples for centuries, and thus comes to recognize God’s presence in the life of his people. We remember the promise he made to our forebears and that, by his continuing presence in our midst, he is the cause of the joy that makes us sing: “The Lord has done great things for us; we are glad” (Ps 125:3). I would like to share with you some of the virtues of this remembrance. The Gospel that we have heard is usually read in a vocational key, and so we concentrate on the disciples’ encounter with Jesus. I would like to go back even earlier, and take a look at John the Baptist. He was with two of his disciples, and seeing Jesus pass by, he told them: “Behold the Lamb of God” (Jn 1:36). On hearing this, they left John and followed Jesus (cf. v. 37). This is somewhat surprising, since they had been with John, they knew that he was a good man, and that, as Jesus would say, of those born of woman none was greater than he (Mt 11:11), yet he was not the one who was to come. John was waiting for someone greater than himself. He clearly understood that he was not the Messiah, but simply the herald of his coming. John remembered; he was mindful of the promise and of his own place in history. John embodies the awareness of a disciple conscious that he is not, and never will be, the Messiah, but only one called to point out the Lord’s presence in the life of his people. As consecrated men and women, we are not called to supplant the Lord by our own works, our missions, or our countless activities. All that we are asked to do is to work with the Lord, side by side, never forgetting that we do not replace him. This does not make us “slacken” in the work of evangelization; rather, it impels us to work all the harder, ever mindful that we are disciples of the one Master. A disciple knows that he or she is there, now and always, to support the Master. That is the source of our joy. It is good to know that we are not the Messiah! It frees us from thinking that we are overly important or too busy (in some places it is not uncommon to hear people say: “No, don’t go to that parish because the pastor is always busy!”). John the Baptist knew that his mission was to point the way, to make beginnings, to open up spaces, to proclaim that “another” was the bearer of God’s Spirit. To be a people of remembrance frees us from the temptation of thinking that we are messiahs. We can fight this temptation in many ways, but also with laughter. Yes, learning to laugh at ourselves gives us the spiritual ability to stand before Lord with our limitations, our mistakes and our sins, but also our successes, and the joy of knowing that he is at our side. A good spiritual test is to ask ourselves whether we can laugh at ourselves. Laughter saves us from the “self-absorbed promethean neopelagianism of those who ultimately trust only in their own powers and feel superior to others”. Brothers and sisters, laugh in community, and not at the community or at others! Let us be on guard against people so important that they have forgotten to smile in their lives. John the Evangelist mentions in his Gospel the time when his life changed: “it was about the tenth hour” (Jn 1:39). An encounter with Jesus changes our lives, it establishes a “before” and an “after”. It is always good to remember the hour, that special day when each of us we realized that the Lord expected something more of us. The memory of that hour in which we were touched by his gaze. When we forget that hour, we forget our origins, our roots; and by losing these basic coordinates, we lose sight of the most precious part of our lives as consecrated persons: the Lord’s gaze. Perhaps you don’t like the place where the Lord found you, perhaps it wasn’t an ideal situation, or “it could have been better”. But it was there that he found you and healed your wounds. Each of us knows where and when: perhaps it was a time of complicated situations, of painful situations; yes, but it was there that the God of Life met you and made you a witness to his Life, a part of his mission and, in union with him, a caress of God for many people. We do well to remember that our vocations are a loving call to love in return, and to serve. If the Lord fell in love with you and chose you, it was not because you were more numerous than the others, for you are the least of peoples, but out of pure love! (cf. Deut 7:7-8). His is a visceral love, a merciful love that impels us in the depths of our being to go out and serve others as Jesus did. I would like to emphasize one aspect that I consider important. Many of us, when we entered the seminary or the house of formation, were shaped by the faith of our families and neighbours. This is how we took our first steps, frequently sustained by displays of popular piety, which in Peru have taken on the most exquisite forms and have deep roots in God’s simple and faithful people. Your people have demonstrated an immense love of Jesus Christ, the Virgin Mary, and your saints and blesseds, in so great a number of devotions that I dare not name them for fear of leaving some of them out. In their shrines, “many pilgrims make decisions that mark their lives. The walls [of those shrines] contain many stories that millions could tell of conversion, forgiveness, and gifts received”. For many of you, the story of your vocation could also be written on those walls. I urge you not to forget, much less look down on, the solid and simple faith of your people. Welcome, accompany and stimulate their encounter with the Lord. Do not become “professionals of the sacred” by forgetting your people, from whose midst the Lord took you. Do not lose your remembrance and respect for those who taught you how to pray. In this way, a religious, a priest, a consecrated woman or man is a person of remembrance, joy and gratitude: three things we need to appropriate and keep as “weapons” against all vocational pretense. Grateful awareness enlarges the heart and inspires us to service. Without gratitude, we can be efficient dispensers of sacred things, but we will lack the anointing of the Spirit to become servants of our brothers and sisters, especially those most in need. The faithful People of God have a sense of smell that enables them to distinguish a functionary of the sacred from a grateful servant. They are able to distinguish someone who is mindful from someone who is not. The People of God are patient, but they also know who serves and heals their wounds with the balm of joy and gratitude. Andrew was one of the disciples of John the Baptist who followed Jesus that day. After spending time with Jesus and seeing where he lived, he returned to the house of his brother Simon Peter and told him: “We have found the Messiah” (Jn 1:41). That was the greatest news he could give him, and it brought him to Jesus. Faith in Jesus is contagious; it cannot be restrained or kept within. Here we see how witness becomes fruitful: the newly called disciples go on to attract others by their testimony of faith, just as Jesus, in the Gospel passage, calls us through others. The mission springs spontaneously from the encounter with Christ. Andrew begins his apostolate with those closest to him, with his brother Simon, almost naturally, by radiating joy. Joy is the surest sign that we have “discovered” the Messiah. Joy is a constant in the hearts of the apostles, and we see it in the enthusiasm with which Andrew tells his brother: “We have found him!” For “the joy of the Gospel fills the hearts and the lives of all who encounter Jesus. Those who accept his offer of salvation are set free from sin, sorrow, inner emptiness and loneliness. With Christ, joy is constantly born anew”. This joy opens us up to others; it is a joy to be shared. In the fragmented world in which we live, a world that can make us withdrawn, we are challenged to become builders and prophets of community. For no one is saved alone. I would like to be clear about this. Fragmentation or isolation are not things that just happen “out there”, only a problem with the “world”. Brothers and sisters, divisions, wars and isolation are found within our communities, and what harm they bring us! Jesus sends us out to build communion and unity, yet often it seems we go about this by displaying our disunity and, worse yet, trying to trip each other up. We are called to be builders of communion and unity, but this does not mean thinking everyone is the same, or doing things always the same way. It means discerning what everyone has to offer, respecting their differences, and acknowledging the gift of charisms within the Church, knowing that while each of us contributes what he or she has, we also need one another. Only the Lord has the fullness of the gifts; only he is the Messiah. He wanted to distribute his gifts in such a way that we can give what is ours while being enriched by that of others. We must be on guard against the temptation of the “only child”, who wants everything for himself because there is no one to share it with. I ask those of you who are in positions of authority: please not to become self-referential. Try to care for your brothers and sisters; try to keep them happy, because happiness is contagious. Do not fall into the trap of an authority that turns into authoritarianism by forgetting that its mission is primarily one of service. Dear brothers and sisters, I thank you once more. May this “deuteronomic” remembrance make us more joyful and grateful to be servants of unity in the midst of our people. May the Lord bless you and may Our Lady protect you. Please do not forget to pray for me.